Somerset Chamber of Commerce invite you to join us to our first Business to Business Lunch. 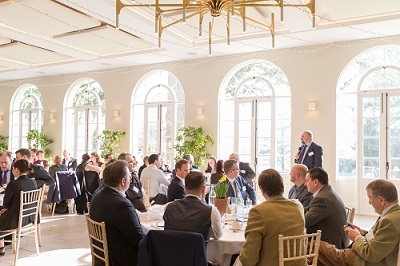 Our B2B's have been one of the most popular in the Chamber events calendar with guests given multiple opportunities to network with different people throughout each course. We are introducing these as lunchtime events, offering networking over 2 courses. Guests are welcomed with the opportunity to network over drinks before being seated for a delicious meal with introductions facilitated by a designated table head. The introductions mean that everyone gets the opportunity to hear from and be introduced to the whole table, sparking interesting conversation and creating meaningful connections. Guests then move to their next designated table between courses so you can introduce yourself to another table...A great way to increase the profile of your business, learn about others and start valuable business relationships. If you are looking to meet like-minded professionals and raise the profile of your business then this is the event for you. Please note the event will be taking place on the first floor of the venue and, unfortunately, there is no lift for disabled access. We apologise for any inconvenience caused. For queries please contact the events team at 01823 444924 or via email. There is a set main and dessert for this booking. Dietary requirements will be catered for, please list these when making payment. All non-members are entitled to attend a maximum of two chamber events before becoming members.